Fredrick had an imaginary friend called Mr. Buttons. 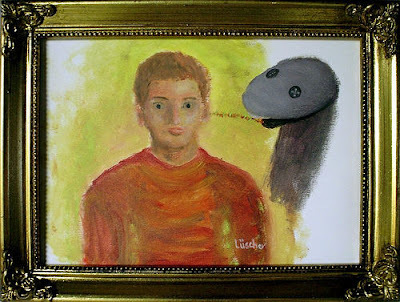 Mr. Buttons spoke into Fredricks ear through a link of psychic energy tendrils. He told Fredrick wonderful things like stories of magical creatures in far off lands, and all about the secret drawer in Daddy's dresser where the gun was. At the trial Fredrick told everyone about Mr. Buttons, but they did not believe him. Just before the execution, Fredrick painted this picture, and then he cheated justice by choking himself to death in his cell with his own sock. The End.